Globally, 90% production of rice is in Asia, and China is the largest producer of rice. China is expected to have largest year ending rice stock all over the world, estimated to be around 75.7 million tons. China consists of 30 million hectare land area under rice cultivation which as compared to India stands at second position, but the use of advanced agriculture equipment and better irrigation facilities has led China to remain at highest rice producing country. Also China accounts for being the largest consumer of rice. It accounts for around 30% consumption of globally produced rice. China is also one of the major producers of hybrid rice. In 2017 per hectare hybrid rice production dropped on account of flood occurrences but also there has been notable increase in land area producing hybrid rice. Thus the value of hybrid rice produced remains same as it was in 2016. By 2018, China is expected to suffer from over stock of hybrid rice, estimated to be around 120 million kg due to declining domestic demand and lower value of exports as compared to total hybrid rice seed supply. Goldstein Research analyst forecast that the China rice industry is expected to grow at CAGR of 2.1% over the forecast period. China rice production was estimated at 210 million metric tons in 2017. The factors such as government support in rice production, favorable climatic conditions, rising number of rice processing companies, increasing exports are majorly impacting the growth of China rice industry. The report covers the present ground scenario and the future growth prospects of the rice industry for 2017-2025 along with the China rice production and revenue of China rice industry. We calculated the market size and revenue share on the basis of revenue generated from major players involved in rice processing across China. We have forecast the market on the basis of producers, suppliers and distributors, exporters and importers. On the basis of rice variety, milled rice accounted for largest market share in 2017 with 85.1% of total rice production. Over the forecast period milled rice is expected to continue their dominance in the rice production. Based on application, 63.2% rice is for food use and rest for other applications. Rice industry outlook 2017-2025, has been prepared based on an in-depth market analysis from industry experts. The report covers the competitive landscape and current position of major players in the rice industry. The report also includes porter’s five force model, SWOT analysis, company profiling, business strategies of market players and their business models. China rice industry report also recognizes value chain analysis to understand the cost differentiation to provide competitive advantage to the existing and new entry players. In the era of technology advancement, there is trend of producing genetically modified (GM) rice to ascertain the quality of rice and food security. Though commercially there is no production of GM rice, but many varieties have been approved for commercial production which is expected to boost the China rice industry. Thus China has developed a type of rice that can be grown in saltwater, a forward step towards sustainability. Rice is a staple crop for 70% of the world and thus the demand for rice is expected to continue to grow over the forecast period. The food security concerns all over the world is driving the growth of the China rice industry, which by exporting rice to various countries is contributing towards global food security. With the climate change, continuous rising demand by consumers and the food security, rice industry is facing the challenge of producing rice without compromising on efficiency, equitability, environmentally-friendly, and more resilience to climate change. It has become imperative to produce rice at lesser land, with lesser water and labor. Based on geography, South West China and Central China are the major rice producing regions. China rice cultivation is dependent upon the climatic conditions, thus divided into 6 agro-climatic zones. Japonica and Indica are major grown rice varieties with 60.7% of japonica rice, 28.1% indica rice and rest other indigenous varieties. 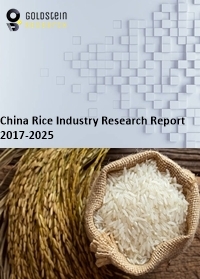 China Rice industry report comprises of the following companies as the key players in the Rice industry: Guangzhou Yotoo Import & Export Co., Ltd., Linghang Group (shanghai) Co., Ltd, Sansan China Industrial Limited, Anhui Jietai Intelligent Technology Co., LTD, SureWave Intl Trade ( GZ ) Co., Ltd.
What is the revenue of Rice industry in 2016-17 and what would be the expected demand over the forecasted period?